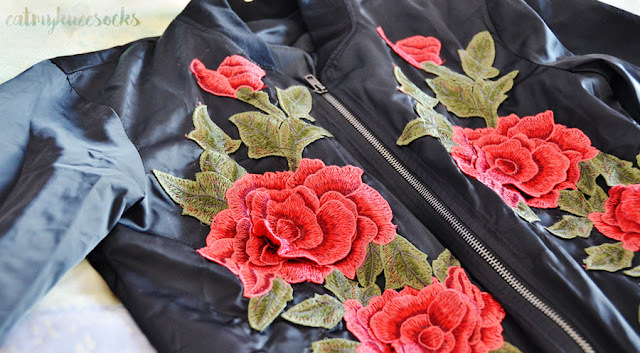 Embroidered floral details and rose appliqué accents are all the rage these days, and I stumbled upon some unique and affordable styles from SheIn that take this trend to a new level. 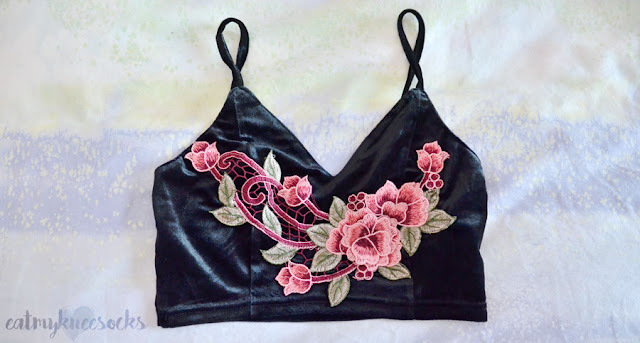 First up: a black velvet floral appliqué bralette, offered in sizes XS-L. This bralette/crop cami top is constructed from a soft velvet, with thin adjustable straps and a muted pink-and-green rose appliqué at the front. The style is simple with a vintage feel, and fits perfectly with the stretchy fabric. I got this piece in size XS, which fits as expected and could stretch to fit slightly larger as well. The fabric is supple yet lightweight and soft to the touch, with partial lining at the front for added comfort and ease of wear. I didn't have high expectations for this piece given that it's priced at just $10, so I'm incredibly impressed with how it turned out! The stitching, style, fit, fabric—everything surpasses what I'd hoped for considering the price point, and all the elements fall perfectly into place with this piece. It's comfortable, versatile, and different, and it pairs well with high-waisted skirts or jeans for a look that you can rock from day to night. 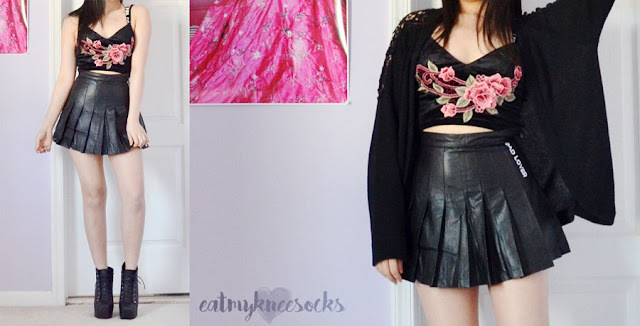 Here, I styled this cropped cami with a pleated faux leather tennis skirt and cutout crochet cardigan; head on over to my latest Romwe review for an alternative look with the same piece! 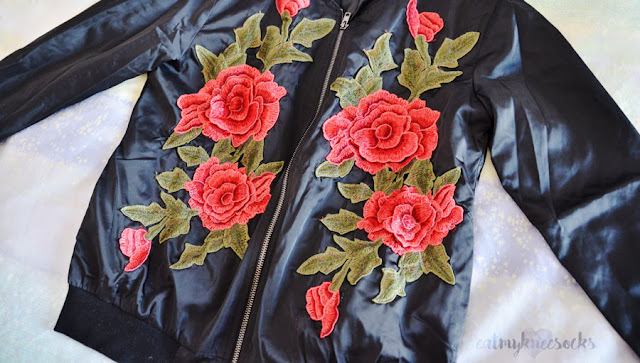 Staying with the floral/rose theme, I also selected a black rose appliqué bomber jacket, originally offered in sizes XS-L. This long sleeve jacket has all your regular bomber jacket characteristics—a lightweight poly fabrication, front pockets, ribbed knit cuffs, and an oversized silhouette—yet spices it up with vibrant floral embroidery. 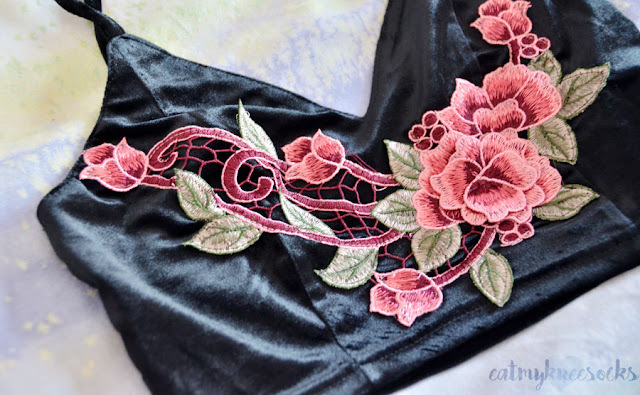 There are beautiful red roses embroidered all across the front, with multiple layers and some half-sewn accents that pop out of the base for a 3D effect. The fabric runs on the thinner side, making it a great piece for spring, and it's super comfortable as well. 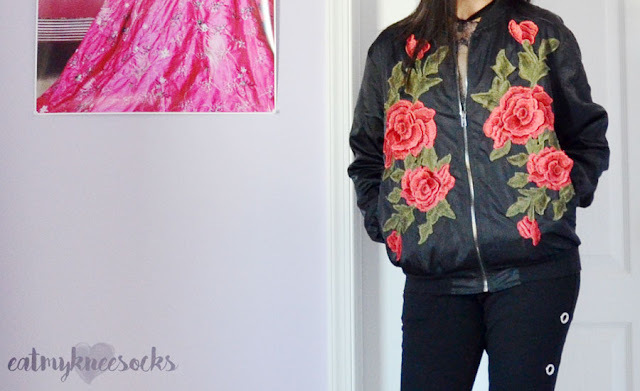 SheIn's photos make the roses appear to be slightly muted in hue, but the actual jacket features bright, bold red flowers for an eye-catching, spring-ready look. The inside is also lined with a silky poly layer for added comfort, and the length is perfect. I got the S instead of the XS for a slightly looser fit and love the result! Wear over a T-shirt and jeans combo for a casual daytime look, or layer over a red lace dress for a night out. 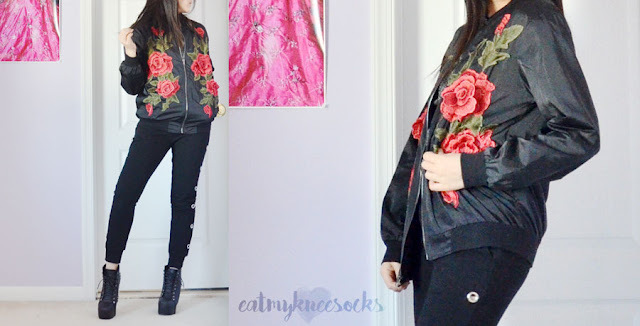 I paired this jacket with a glittery mesh top as well as a harness bodysuit and cutout joggers (reviewed here) for more of a streetwear-inspired look, but this piece pairs well with so many options! 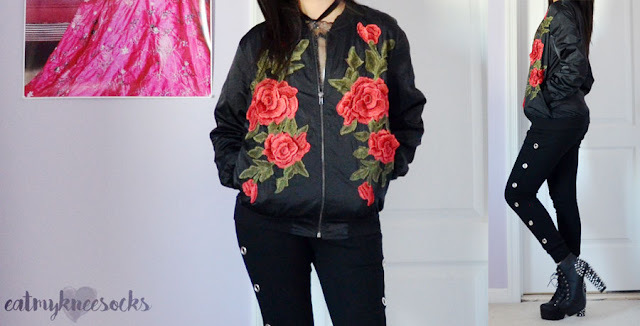 I hope you all enjoyed this rose-themed mini fashion haul from SheIn! I'm really excited about both these pieces and can't wait to wear them out—the look, fit, and quality of both the cropped cami top and floral bomber jacket were all a pleasant surprise, and the prices were too good to resist. 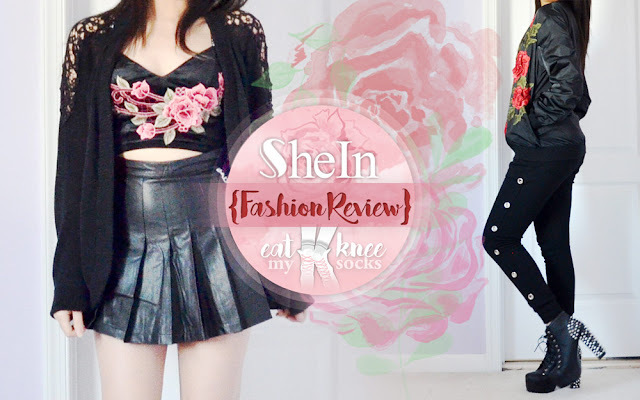 Check out more SheIn-specific reviews here, or feel free to browse through my general fashion hauls here! If there's anything specific you'd like me to review, feel free to drop a comment, and I might just check it out for you. And as always, thanks for reading; I'll see you next time!